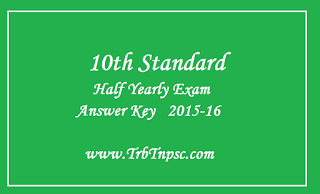 Tamilnadu Government conducts Half yearly Common Examinations every year at the end of first term - (September). Now the Half yearly Examinations are conducted on the content of Samacheer Kalvi Text Books throughout tamilnadu. These Exams will be conducted common, that is all the state board schools should follow the same question papers especially 10th Standard & 12th Standard. At the end of every exam our TRB TNPSC team & Padasalai.Net team will prepare the Answer Keys within one hour and published for the help of students as well as teachers. 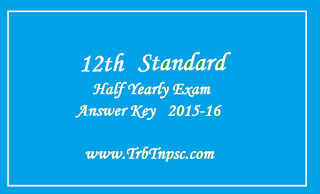 These Answer Keys are prepared by well-versed subject published of key answers, so that the students and teachers can analyse the best one for their evaluation. The quick and accurate answer keys guide the students to know the exact answers and helps to prepare for the next day exams well.